Though he fractured his wrist this summer, the pope still worked on the second part of his book “Jesus of Nazareth,” and dictated the revisions to it. According to the Vatican spokesman, it will be published in the spring. 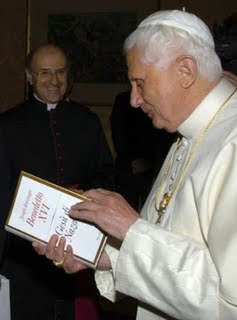 Begun by then-Cardinal Joseph Ratzinger in 2003 with an eye to his planned retirement to his native Bavaria, the first volume of Benedict's Jesus was released in May 2007, going on to sell over 2 million copies worldwide. In a recent interview with L'Osservatore Romano, B16's top aide framed the series as a key to the pontiff's aim of "reforming the church" -- an end that, according to Cardinal Tarcisio Bertone, "is above all a question of interiority and holiness."